A 53-year-old man presented with complaints of a temporal shadow in his left eye (OS) for 4 days that was progressively worsening and accompanied by mild eye pain. The patient reported no photopsias or floaters. He had no significant ocular history, and his medical history included nephrolithiasis, gout, migraine, depression, and anxiety, for which he was being treated. He was an active smoker. • Ocular syphilis can involve any ocular structure and can manifest in many forms. • Syphilitic uveitis should be treated with a 10- to 14-day course of intravenous penicillin. • Because of the high rate of coinfection, testing for HIV is crucial in patients with ocular syphilis. On examination, the patient’s BCVA was 20/20 in the right eye (OD) and 20/40 OS. His pupils were equally round and reactive to light, and there was no relative afferent pupillary defect. Intraocular pressure (IOP) was 12 mm Hg in each eye (OU). Anterior segment examination revealed mild nuclear sclerotic cataract OU and rare anterior chamber cell OS. There were occasional cells in the anterior vitreous OS. No evidence of intraocular inflammation was noted OD. Dilated funduscopic exam OS revealed clear media, a mildly hyperemic disc with mild blurring of the disc margins, small areas of deep retinal hypopigmented lesions measuring about 100 µm to 300 µm scattered throughout the posterior pole, and a semicircular area of deep retinal hypopigmentation nasal to the fovea. Dilated fundus examination OD was unremarkable (Figure 1). Figure 1. Widefield color fundus photos OD (A) and OS (B) reveal areas of deep retinal hypopigmented lesions OS. 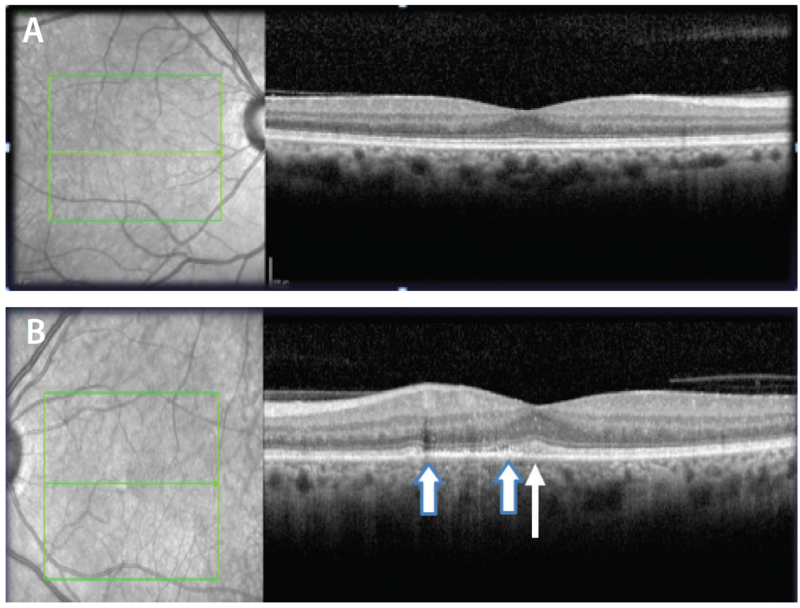 Optical coherence tomography (OCT) OS demonstrated areas of disruption of the ellipsoid zone (EZ) scattered throughout the macula but most prominent just nasal to the fovea. OCT was also notable for thickening of the EZ in the fovea and small hyperreflective flecks throughout both the inner and outer retina. OCT was normal OD (Figure 2). Fundus autofluorescence (FAF) imaging revealed focal round areas of hypoautofluorescence on a hyperautofluorescent background throughout the posterior pole OS. FAF was normal OD (Figure 3). Fluorescein angiography (FA) showed small, scattered areas of hyperfluorescence throughout the posterior pole OS with a semicircular area of late staining nasal to the fovea and late hyperfluorescence of the disc (Figure 4). FA was normal OD. Figure 2. OCT images OD (A) and OS (B) reveal disruption of the EZ nasal to the fovea (area between wide arrows) and thickening of the EZ in the fovea OS (thin arrow). The patient is a 53-year-old man with subjective visual field abnormality, decreased visual acuity, and posterior uveitis. Differential diagnosis includes inflammatory, infectious, and neoplastic causes. Possible inflammatory etiologies include multiple evanescent white dot syndrome (MEWDS), multifocal choroiditis, and sarcoidosis. Infectious causes to consider are syphilis and tuberculosis. Lymphoma must also be considered in older patients with vitritis and white lesions in the posterior pole. Figure 3. FAF OD (A) and OS (B) shows focal areas of hypoautofluorescence on a background of hyperautofluorescence OS. The patient was initially diagnosed with MEWDS. At a follow-up appointment 2 weeks later, his symptoms were unchanged. The patient was lost to follow-up and was seen 10 months later at the New England Eye Center. At that visit he complained of “sepia tone” vision and said it seemed as though he was looking through cheesecloth. A thorough history and review of systems was obtained at this time. The patient acknowledged issues with memory over the past year. Additional social history was obtained, and he revealed that he had emigrated from Romania in 1964, and he lived with a monogamous male partner of 25 years. His BCVA was 20/20 OU. He was able to see seven of seven Ishihara color plates OD and one of seven OS. IOP was 12 mm Hg OU. Anterior segment examination did not reveal any inflammation. The anterior vitreous OD was clear, but there was 1+ cell and trace haze OS. Figure 4. Early (A), mid- (B), and late phase (C) fundus FA OS reveals scattered, punctate areas of hyperfluorescence with late staining of the nasal macula and a hot disc. 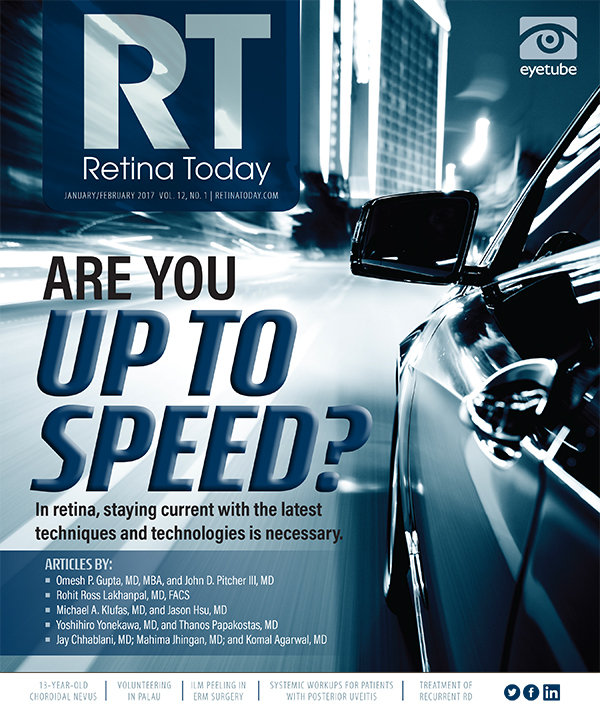 The deep retinal lesions were no longer visible at this visit; however, FAF showed persistent punctate areas of hypoautofluorescence, and FA showed persistent areas of hyperfluorescence throughout the posterior pole and a hot disc. Indocyanine green angiography (ICGA) showed diffuse hypercyanescence with scattered areas of blocking secondary to vitritis OS (Figure 5). At this time, a systemic workup was performed, including angiotensin converting enzyme, lysozyme, rapid plasma reagin (RPR), fluorescent treponemal antibody absorption (FTA-ABS), QuantiFERON-TB, and a chest x-ray. RPR returned positive at a titer of 1:128, and FTA-ABS was also positive. Other testing was unremarkable. An HIV test was ordered and came back negative. Figure 5. Early (A), mid- (B), and late phase (C) ICGA OS shows diffuse background hypercyanescence with areas of blocking secondary to vitritis. The patient was referred to the infectious disease clinic and completed a 14-day course of intravenous penicillin. His floaters and “sepia tone” vision improved 10 days after completing treatment. Clinical exam revealed persistent anterior chamber and vitreous cells, and treatment with topical difluprednate ophthalmic emulsion 0.05% (Durezol, Alcon) was initiated. Two months later, the patient’s vision continued to improve subjectively, and the inflammation had completely resolved. He required chronic treatment with difluprednate to control persistent intraocular inflammation. One year later, his visual acuity was 20/50 OS due to posterior subcapsular cataract and an epiretinal membrane. The patient also developed steroid-induced glaucoma for which he underwent tube shunt surgery. His inflammation, IOP, and vision have since remained stable. If one suspects that a patient has ocular syphilis, it is important to check both nontreponemal tests (ie, RPRand/or venereal disease research laboratory) and treponemal tests (ie, FTA-ABS), as nontreponemal titers often decrease late in the disease and may therefore result in a false negative test. Syphilitic uveitis should be treated as neurosyphilis with a 10- to 14-day course of intravenous penicillin. Nontreponemal titers are followed to determine response to treatment. Successful response is defined as a fourfold decrease in nontreponemal titers after 6 months.3 FTA-ABS remains positive even after treatment, and this should not be used to assess response to treatment. This case demonstrates syphilis as one of the great masqueraders and emphasizes the importance of performing a systemic workup for all patients with posterior uveitis. 1. Kiss S, Damico FM, Young LH, et al. Ocular manifestations and treatment of syphilis. Semin Ophthalmol. 2005;20(3):161-167. 2. Pichi F, Ciardella A, Cunningham ET, et al. Spectral domain optical coherence tomography findings in patients with acute syphilitic posterior placoid chorioretinopathy. Retina. 2014;34(2):373-384. 3. Davis JL. Ocular syphilis. Curr Opin Ophthalmol. 2014;25(6):513-518. 4. Eandi CM, Neri P, Adelman RA, et al. Acute syphilitic posterior placoid chorioretinitis: report of a case series and comprehensive review of the literature. Retina. 2012;32(9):1915-1941. 5. Li SY, Birnbaum A, Tessler HH, Goldstein DA. Posterior syphilitic uveitis: clinical characteristics, co-infection with HIV, response to treatment. Jpn J Ophthalmol. 2011;55(5):486-494. 6. Browning DJ. Posterior segment manifestations of active ocular syphilis, their response to a neurosyphilis regimen of penicillin therapy, and the influence of human immunodeficiency virus status on response. Ophthalmology. 2000;107(11):2015-2023. • retina specialist at New England Eye Center; assistant professor of ophthalmology at Tufts University School of Medicine in Boston, Mass. • uveitis specialist at New England Eye Center and Ophthalmic Consultants of Boston; assistant professor of ophthalmology at Tufts University School of Medicine in Boston, Mass.